How do these numbers compare to the previous week? Or the same period in the prior year? How do the numbers compare to similar buildings in the region? What are some of the biggest energy consuming factors? Surely in winter it’s heating but what else and how many people contribute to this? What does the average citizen consume in energy? The tagline, while helpful, doesn’t state the year, so when I go back to the prior year, how do I now know which year I’m looking at? 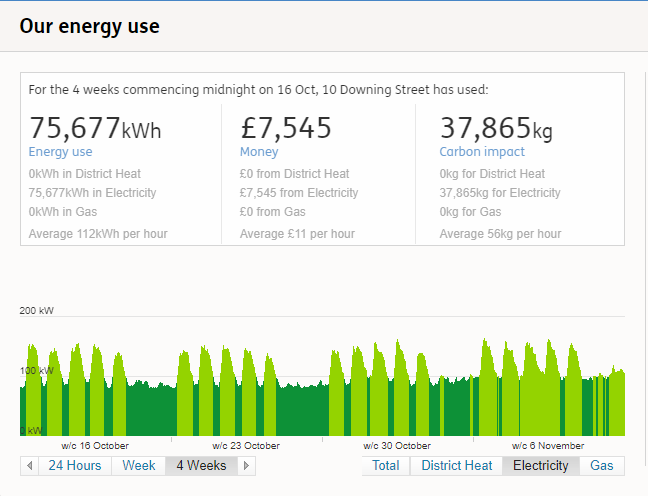 Heatmaps help see patterns in data, especially when it’s neatly broken down into hours, days, weeks, months and years. I found it interesting that June 2017, especially the week of 18th June, had such high electricity consumption compared to the surrounding .weeks and chose to focus on those data points. A bit of online research showed that on the one hand, there were paticularly high temperatures, so it could be that air conditioning etc. caused the spike. On the other hand there were two terror attacks that month in London. One on London Bridge on 3rd June and one at the Finsbury Park Mosque on 19th June. While I don’t have proof, my suggestion is that higher than usual levels of security and media activity surround the second attack may have led to the higher electricity usage during that week.